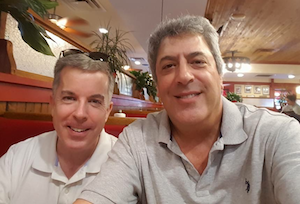 It was a quick visit to Dallas but I gave my friend and audio producer extraordinaire Cliff Zellman a heads up at FaffCon that I would be in town this week. Cliff produces some of the best and most effective (I suppose being most effective would make them the best, wouldn’t it) automotive commercials in the country (no I’m not a voice talent on those spots – those ladies and gentlemen have wonderfully particular talents that I do not). You likely have these car spots in your market and they are amazing, in large part because of Cliff meticulous production. He also produces impressive voice-over demos as well. I got to hang at Cliff’s studio for a while and then he took me to one of his favorite BBQ joints, which was awesome. We solved most of the voiceover world’s problems but then realized no one would listen to us anyway. Thank you Cliff for being a good friend and an awesome host! P.S. Don’t touch his guitars!